`If outdoor activities with young children have always baffled you, then this is the book for you. Practical in style and structure, it has an accessible approach which is based in the best early years practice and provides plenty of challenges and new ideas. It is a must have for your early years setting.' - Kathryn Solly, Headteacher at Chelsea Open Air Nursery School and Children's Centre, UKA garden can be a magical place for young children and offers them rich and engaging learning experiences as they interact with a variety of plants and wildlife throughout the year. This book guides you through the process of creating a garden, however small, for young children. It looks at the impact a garden area can have on children's overall development and the benefits of using natural materials as learning tools. Full of practical advice on how to design, develop resource and use a garden area, this book brings together:advice on planning a garden and how to get children, parents and the local community involvedideas for settings with limited spaceideas for different spaces including a wildlife space, a woodland space, a digging area, sand and water spaces and a growing areasuggestions of plants, flowers and crops to grow with very young childreninformation about the wildlife children may discovera calendar guide to activities and garden planning throughout the yearways to encourage children to develop a sense of awareness of the importance of conservation and sustainabilityguidance on health and safetyclear links with EYFS to show how a garden supports the areas of learning and development. 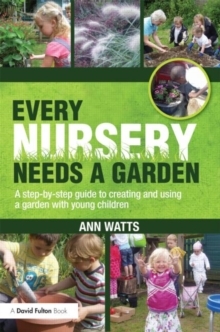 Written for all early years practitioners, this book is the definitive guide for those looking to further enhance their outdoor environment and fulfil the potential learning opportunities that a garden can provide.